In today's dynamic workplace, learning must become an integral part of work?and it must take place in collaboration with others as teams solve problems together. Learning is now the key to increased productivity and innovation for organizations in the twenty–first century. 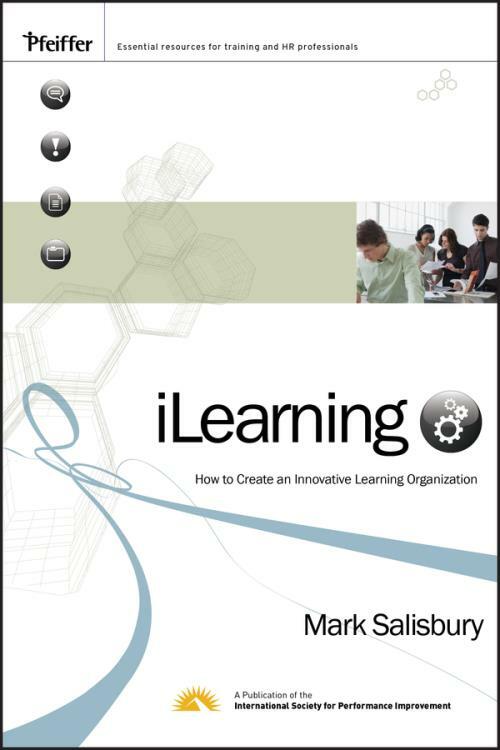 Written by Mark Salisbury, an expert in human performance solutions, iLearning shows how organizations can implement learning systems in a collaborative, comprehensive, and systematic way. By using performance objectives to manage knowledge, organizations can embed training, best practices, and expert advice in their collaborative work processes. iLearning organizations can also use detailed knowledge to improve their processes and, most important, organizations that embrace iLearning can more accurately anticipate new challenges and plan strategically for innovation. Written for managers of knowledge workers, trainers, human resource professionals, and information technology specialists, iLearning is filled with the right knowledge, for the right people, at the right time. Introduction: Getting the Most from This Book. SECTION 1. FACILITATING COLLABORATIVE WORK. The Life Cycle of Knowledge. Cognition is Distributed Across Individuals. Cognition is Distributed in Artifacts. Cognition is in the History of Artifacts. How to Distribute Cognition Across Individuals. How to Distribute Cognition in Artifacts. How to Capture Cognition in the History of Artifacts. 3. Agreeing on the Workflow Process. Traditional Ways Fail to Define Processes. Story Telling to Define Processes. How to Recognize Failure to Define Processes. How to Use Story Telling to Define Processes. 4. Defining the Roles within the Process. "Rules of Engagement" Between Roles. How to Identify Specific Roles. How to Define "Rules of Engagement" Between Roles. Knowledge Products have Performance Objectives. Performance Objectives Support Collaborative Work. How to Identify Performance Objectives. How to Support Collaborative Work. SECTION 2. FACILITATING INNOVATIVE LEARNING. How to Identify Tacit–Explicit–Tacit Cycles. How to Identify Factual Knowledge. How to Identify Conceptual Knowledge. How to Identify Procedural Knowledge. How to Identify Metacognitive Knowledge. Expert Advice Embodies Metacognitive Knowledge. How to Provide Access to Factual Knowledge. How to Provide Access to Conceptual Knowledge. How to Provide Access to Procedural Knowledge. How to Provide Access to Metacognitive Knowledge. How to Manage Tacit Knowledge. Novices Understand and Remember Knowledge. Practitioners Analyze and Apply Knowledge. Experts Create and Evaluate Knowledge . How to Understand and Remember Knowledge. How to Analyze and Apply Knowledge. How to Create and Evaluate Knowledge . How to Meet the Cognitive Needs of Learners. SECTION 3. ENABLING AN ILEARNING ORGANIZATION. 10. Locating and Marshalling Expertise. Social Network Analysis for Locating Expertise . Marshall Expertise for Knowledge Assets. How to Use Social Network Analysis . How to Marshall Expertise for Knowledge Assets. 11. Ensuring Incentives to Share. People Work in Their Own Self Interest. Hard Rewards for Knowledge Sharing. Soft Rewards for Knowledge Sharing. How to Align with People’s Self Interest. How to Develop Hard Rewards. How to Develop Soft Rewards. 12. Measuring Individual Learning and Performance. Examples are a Performance Measure. Documents are a Performance Measure . Instruction is a Performance Measure. Expert Advice is a Performance Measure. Performance Objectives are a Performance Measure. Total Knowledge Assets are a Performance Measure. How to Measure Expert Advice. How to Measure Performance Objectives. How to Measure Total Knowledge Assets . 13. Improving Team Learning and Performance. How to Support Single Loop Learning . How to Support Double Loop Learning . How to Support Team Learning. 14. Managing Organizational Learning and Performance. How to Support Single–Loop Learning . How to Support Double–Loop Learning . How to Support Organizational Learning. Applying Methodologies and Deploying Technologies. How to Organize Knowledge Assets. How to Reuse Knowledge Assets. How to Share Knowledge Assets . How to Repurpose Knowledge Assets. Knowledge Assets Linked for Reuse. Knowledge Assets Linked for Repurpose. How to Link Knowledge Assets for Reuse. How to Link Knowledge Assets for Repurpose. How to Update Reused Knowledge Assets. How to Update Repurposed Knowledge Assets. Development of a System Concept. Role–Based Access to Knowledge Assets. Assessment of Learning and Performance. How to Design a System Concept. How to Manage the Knowledge Products of Work. How to Manage the Knowledge Assets for Learning. How to View Knowledge Assets by Role. How to Assess Learning and Performance. SECTION 4. FUTURE DIRECTIONS FOR ILEARNING. New Media Forms are Available. How to use Mobile Technology to Support iLearning . How to use New Media Forms to Support iLearning. How to use 3–D Environment to Support iLearning. iLearning is Changing K–12 Schools . iLearning is Changing Colleges and Universities . iLearning is Changing the Global Economy. How to Change K–12 Schools with iLearning . How to Change Colleges and Universities with iLearning. How to Change with the Global Economy using iLearning.